I was 12 years old when I began to study the trumpet and composed my first composition. My first teacher was Earl Jones, who played the alto saxophone. He is the person responsible for me playing the trumpet. Henderson Howard was a trumpeter and the person who did the most to help shape my creative skills as a trumpet player and who instilled in me the "trumpeter spirit" - to be able to play at a high level, to use the complete range of the trumpet with a clear tone, to feel and know the horn as me, with phrases and articulation, playing the horn from top to bottom. He is the one who developed my inner sense of how to utilize the spirit of performance as a part of the music. He was a great teacher. The legendary Blues master Alex "Little Bill" Wallace was my stepfather. It was his artistic image that caused me to think about becoming a musician. Often, he would bring musicians to our house on afternoons or nights when they were off, which helped to create an artistic environment in our home. From him, I learned how critically important it was to look for originality in musicians, and how their sound and rhythm was a major part of their artistic quality; how to organize a band and how to manage it. I will reflect on two important aspects of my concept for composing. Firstly, my compositions are non-metric designs in regards to their rhythmic and sonic construction. The horizontal flow of the rhythms and sonic elements of a composition are achieved through a proportional structuring of the music´s geometric forms that, in performance, is realized by the shape of the music´s properties and not by its metric count. In this context, a singular musical figure will have multiple shapes when executed, depending on the creative level of the ensemble performers and my possibility to read and direct the performers´ creative energy. Therefore, each musical line in the score will have a constant ratio to the other lines, but the quantities or measurable properties within the score will be subjected to individual choices when performed. Secondly, the builders of musical instruments have created a large range of instruments with different tonalities. Whatever their reasons for this practice, it is clear to me that this aspect of their creation can benefit a composer who is willing to find a use for that idea in their music-objects, scores, and with the ensemble performers/improvisers. When I compose, I do not change the tonality of the instruments being used, such as those in B flat, A, F, E flat, G, D or C, through transposition in order to have their musical properties realized in a designed C spectrum (I do at times use an instrumental transposition if I need a line in unison, but not as a compositional practice). I do not believe in reducing the sonic field to a singular tonal spectrum, where one could have a multiple sonic spectrum that shares the same musical grid without losing that large world of possibilities inherent in the sound universe. When we as composer-artists allow each instrument to activate their sonic spectrum based upon the tonality of the instrument as designed, we redefine the composer´s position from the traditional practice of making scores that are essentially C spectrum in performance. The composer could choose to research a richer field of the sound universe and create musical constructions that are not just C spectrum based, whereby his/her scores could be built with any other possible realization of the sonic spectrums, limited only by what they themselves can imagine their music to be. The clearest insight into what I seek in music as a creative artist is centered on the idea of the psychology of music, where a fully realized work of music can express that "something else" that is connected to the musical note/pitch/silence/space, and the notion of the performance practice created in the music. I believe that music can illustrate the psychological elements that we carry in our conscience and that we develop through education and our life experience. This same psychological energy is at the core of the events and objects we create/shape. This energy can be highlighted in a performance by the composer/performer through the musical moments that musicians are able to create. And, the people, who are in attendance and are focused, can achieve a higher level of realization of what the music is for them. "Is a democracy, such as we know it, the last improvement possible in government? Is it not possible to take a step further towards recognizing and organizing the rights of man?" On September 17, 2011, a gathering of individuals occupied Zuccotti Park on Wall Street, New York, New York, in protest of the nation´s growing economic disparity. Within weeks a conflagration of similar events had spread around the globe, fueled by a simple truth: that the global phenomenon of enormous concentrations of wealth in the hands of a select few - the 1 % - stands as a barrier to universal human rights; a root cause undermining economic fairness, political freedom, environmental justice and, ultimately, human dignity. At its peak, Occupy events displaying the movement´s slogan of inclusion "We are the 99%" had erupted in over 600 communities in the United States, in 85 countries, and on every continent other than Antarctica. Yet, within a few months, the Occupy movement had faded to a few stalwarts residing in pitched tents in a handful of cities, including Washington, D.C. and London. By early 2012, these last enclaves had been evicted by the authorities, leaving the movement little more than a marginalized news story and a vestigial internet presence. But out of that brief intense period of chaos was born a potent new vocabulary of protest and a reminder of how powerful a lever of change confrontational civil disobedience can be. Despite its apparent failures, some self-inflicted, the Occupy movement erupted at a critical juncture in U.S. political history, gifting an embattled progressive movement and a besieged Democratic Party with a symbolic reference point and a simple, powerful slogan with which to fight back. It is not insignificant that the concept of the 1% began to penetrate mainstream political speech and leaders of the left came to embrace a new populism. Perhaps most importantly, as if granted permission by the Occupy camps´ physical presence, the beleaguered progressive movement, especially labor unions and many establishment elected officials, exhibited a surge of confrontational spirit that previously had been suppressed beneath the weight of internalized cynicism and an onslaught of far right extremism. It could even be argued that in some concrete ways, the Occupy movement´s focus on economic injustice aided in Republican presidential contender Mitt Romney´s downfall and the reelection of President Barack Obama. It is hard not to see in the immediate backlash to Romney´s famous "47%" statement echoes of the Occupy movement´s 99% symbology. Romney´s speech, recorded surreptitiously by a bartender, epitomized the wealthy classes´ sense of entitlement and its disregard for the plight of the majority that the movement was designed to combat. In the end, instead of achieving a single political goal, the Occupy movement had established a paradigm, one that penetrated the social consciousness and shifted the nation´s political terrain in a way that both bore immediate fruit and laid the foundation for future change. The question now is, what will become of the Occupy movement? Will it fade, engulfed by the rapidity of modern media cycles, defeated by its own resistance to leaders and other organizational structures, a victim of its own idealism? Or will it evolve and re-emerge in a stronger form? These questions, perhaps even more than the successes or failures of the initial Occupy movement, lie at the heart of Wadada Leo Smith´s dynamic composition "Occupy the World for Life, Liberty and Justice." 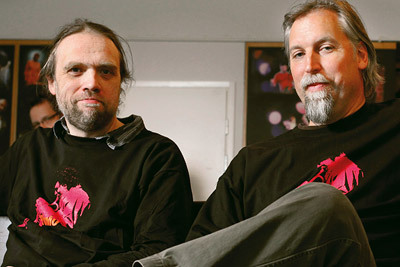 Smith has long inhabited the space where political and artistic movements converge. In many ways, "Occupy the World for Life, Liberty and Justice" can be seen as an extension of Smith´s recently completed treatment of the civil rights movement in Ten Freedom Summers, a 4-CD collection of compositions, that documents the psychological impact on the nation of the civil rights movement. To Smith, the Occupy movement possesses the potential to be the next evolutionary step in that same struggle for universal human rights. After all, as Smith points out, the physical occupation of space may be the most basic form of protest. It was, in fact, the occupation of a bus seat by Rosa Parks that ignited the Montgomery boycotts and became a symbolic touchstone fomenting further protest. Smith also rightfully reminds us that the earliest civil rights actions were dismissed, just as the Occupy movement has been. The civil rights movement had to rise and resurge multiple times before it was able to build into a lasting wave of change. This sense of repeated renewal is reflected throughout "Occupy the World for Life, Liberty and Justice," which is structured as a composite score, with several overlapping scores. As Smith explains, "one of [the scores] is called ‘Black Hole´ and is based on the scientific definition of the black hole, where there is the rim where things are relatively stable, and then, over the rim, that is when all the energy explodes. Inside ‘Occupy,´ I have used the score for ‘Black Hole´ and the ‘glissando form´ from my String Quartet ‘In The Diaspora: Earthquakes and Sunrise Missions´ ... to represent the idea of diversity, as should the people of the Occupy movement. And that the movement must have courage to expand its notion to include a larger idea of unity, freedom; and to comprehend a deeper use of the political forms in our society." It is this combination of explosive movement with diversity of participation that Smith identifies as the distinguishing feature of the Occupy movement, and in it lies the seed of hope he finds so powerful. Smith envisions a movement that unites today´s disparate streams of progressive change - from indigenous rights, to women´s rights, to human rights - into a fluid, universal movement for change. According to Smith, only by uniting and recognizing common purpose and common obstacles can these movements ultimately overcome the concentrated power of the global elite. "As spontaneous as the Occupy movement was, it also must continue to grow, to address the political, the social and all the other issues that count in a society." In the Occupy movement´s dedication to heterogeneity and inclusivity, Smith sees a path towards achieving this goal. The diversity of the 99% must simultaneously unify and maintain its multiplicity of identities, to acknowledge them and to focus their resources to confront the hegemony of the 1%, and, eventually, to develop a harmonious society that will establish life, liberty and justice for all human beings in our world. Queen Hatshepsut (Wadada Leo Smith) is a composition dedicated to Queen Hatshepsut (1508 - 1458 BC), who was the fifth pharaoh during the 18th dynasty in ancient Egypt. Although she may not have been the first female to hold the formal position of a head of state in Egypt, she is commonly considered the first true female ruler of a major civilization in world history. The reign of Queen Hatshepsut was much longer and more prosperous than that of any other female or, for that matter, most male pharaohs, before or after. Although she had initial success in warfare early in her reign, Queen Hatshepsut is above all considered to be the pharaoh who inaugurated a long peaceful period that led, due to improved trade relations, to great wealth in Egypt. She was also considered one of the most prolific builders in ancient Egypt, commissioning hundreds of building projects throughout both Upper and Lower Egypt. Wadada Leo Smith: "Queen Hatshepsut" begins with an introduction that is orchestrated with a unison line for the ensemble. This represents a ceremonial impression of the majestic royal courts of ancient Egypt. What follows are three composed sections that are designed for collective improvisation. These sections are based upon a composite score where each performer must construct their individual parts spontaneously from the score grid and mix their constructed line with improvisation. Solos emerge from the drone section. The second section is a singular melodic-unit distributed throughout the ensemble in parallel-inversion and its sonic field is pan-tonal in scope. The trumpet then solos over a drone of a singular pitch orchestrated for the tonality of the instruments. The third section is a collective improvisation for the ensemble after which the composition ends. The Bell - 2 (Wadada Leo Smith) is a new composition that took as its starting point Wadada Leo Smith´s first recorded composition, "The Bell," that was included on Anthony Braxton´s first recording as a leader, 3 compositions of new jazz (Delmark), in 1968. The recording featured Braxton, violinist Leroy Jenkins (3/11/32 - 2/24/07) and Wadada Leo Smith, who collectively became known as the Creative Construction Company. For this early recording, pianist Muhal Richard Abrams joined the three on "The Bell" and one of Braxton´s two compositions. 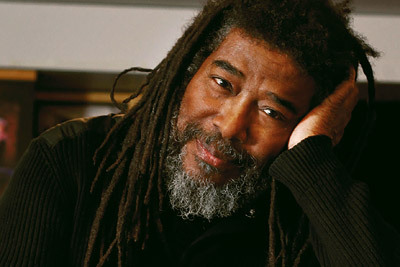 Wadada Leo Smith: "The Bell - 2" is a composition for a large ensemble. I wanted to create a new work based upon the quartet version that was recorded in Chicago in 1968 for Anthony Braxton´s album 3 compositions of new jazz. The large ensemble version is derived from the quartet version, but is not an orchestration of it, although the quartet version is included in the score with a lot of additional composed music. That is why I call it "The Bell - 2." What makes "The Bell" so important to me is that it was the first composition through which I discovered the rhythm-units and how to use them in my music. In fact, I learned how to use and how to think about the rhythm-units while listening to the playback of "The Bell" in the studio after we had recorded it. In the score, I had placed the rhythm-units in a dotted box so as to illustrate that they were not to be played like the other music included in the score and to underline the need to articulate the rhythm-units in a different way. What that way would be, no one knew, but I had a feeling that it would be something about sound and silence and that it would be different from the traditional practice of interpreting rhythms. In the recording session in 1968, I conducted the rhythm-units when they were supposed to be played but, when the rhythm-units had finished, Muhal Richard Abrams and I continued to play by adding new units to the moment. This is when I realized what the units should sound like and how to use them in music performances. "The Bell - 2" differs from the quartet version in its newly-composed introduction/prelude, its use of electronics and its improvisational section in the end, that together give the composition a three-part structural design. The collective improvisation section, which comes after the compositional form has been completed, is a forum for the instrumental families in the ensemble to interface with each other. There is a viola theme that re-occurs in the last part of the improvisation. Mount Kilimanjaro (Love And Compassion For John Lindberg) (Wadada Leo Smith) is a sister composition to "The Africana World," which was recorded by Wadada Leo Smith´s Silver Orchestra, a 15-member orchestra made up of some of the leading names in improvised music, in 2004 (Lake Biwa, Tzadik). Violinist Jenifer Choi was the principal soloist on that earlier composition. For TUMfest12 and this recording, Smith expanded "The Africana World" into a new concerto for bass violin and orchestra featuring his longtime colleague and friend John Lindberg as the soloist. Wadada Leo Smith: John Lindberg and I have been best friends and musical partners for over 30 years. Our communication is of the highest order, as high as it can get. On stage, no matter what happens, I know that John has already realized what´s going on and has begun to make adjustments through the quality of his decisions. And, as best friends, we communicate on all different levels and share our time in deep conversations or while having a fantastic meal together or simply just looking into life. In "Mount Kilimanjaro," the bass line is scored with musical elements that flow over the ensemble parts and John´s magnificent improvisation throughout the score. His musical quality uniquely highlights the best conditions for hearing the orchestral colors. I decided to name this new composition for Mt. Kilimanjaro, which is located in Northern Tanzania and, because of its height and snow-capped peaks as well as its location in the Equatorial zone, has a beauty found nowhere else in the world. It is the world´s largest single mountain, with five vegetation zones, volcanic and glacier, and is enormously biodiverse. It is often veiled in clouds. As a composition, "Africana World" can be extended for other solo instruments and different orchestras. As this compositional idea continues to grow, it will feature some element of Africa and its world. The first "Africana World" with a violin soloist symbolized a global cultural connection, whereas in "Mt. Kilimanjaro," there is mystique and dynamical diversity energy element inferred in the composition. Crossing On A Southern Road (A Memorial For Marion Brown) (Wadada Leo Smith) is dedicated to the late saxophonist Marion Brown (9/8/31 - 10/18/10), whom Smith, a fellow Southerner, has described as "the most Southern guy I ever knew." Although Marion Brown spent an extended period in the late 1960s working in Europe and Anthony Braxton, Leroy Jenkins and Smith had also moved to Paris in 1969, Brown and Smith met for the first time at a concert at the University of Massachusetts in 1970 after both had already returned to the United States. After Smith had moved to New Haven, Connecticut, during the summer of 1970, Brown extended his hospitality to Smith and his spouse by inviting them to stay in his home for a period of months when they were getting settled in New Haven. 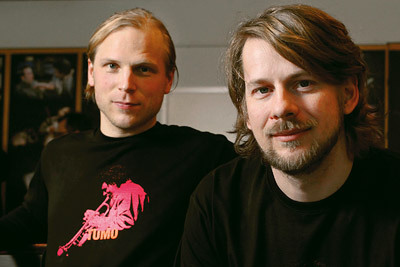 The two also founded the Creative Improvisation Ensemble in September 1970 and recorded a duo album (Creative Improvisation Ensemble/Duets, Freedom) in New York City in December 1970. In 1973, Brown featured Smith on his recording Geechee Recollections (Impulse). The initial inspiration for this composition came from Sterling Allen Brown´s first book of poetry, "Southern Road," which was published in 1932. The somber mood of "Crossing On A Southern Road" is explained by Smith´s observation that: "A Southern road was not a sunny, pleasant experience but rather a dangerous and threatening place." Wadada Leo Smith: Marion Brown was a wonderful, sure-willed and creative artist. He was a performer-composer, a very clear and effective writer, and a magnificent painter. We had many great moments working together, dreaming and, sometimes, just sitting in a pure quiet state of reflection while enjoying the moment. This composition was an inspired dream work, which was never realized in a performance until TUMfest12 and this recording. The dream was an experimental idea about artistic choices or the decision-making that one uses as his/her strategy that they implore after the journey has begun. It is music for multiple ensembles, with the lower ensemble consisting of strings and harp unit, guitars and percussion unit. The first middle ensemble has the piano and the accordion as well as the wind instruments. The second middle ensemble has a tuba unit (we only used one tuba, but it could have been from three to five). The top ensemble is composed for a large unit, but is performed here as a trumpet solo with improvisation. With the ensembles crossing each other, they create a very dense field of musical textures that does not come to a settled zone of musical activity until the compositional form reaches its end. What comes next is a large collective improvisation section by the orchestra that is intended to balance the opening compositional form. There are a few structured elements inserted from the composition that are used in the improvisational form and were conducted into the musical flow of this section. 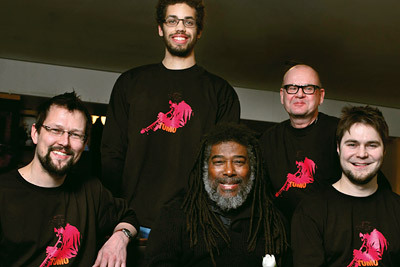 Occupy The World For Life, Liberty And Justice (Wadada Leo Smith) was commissioned by the Oxford Improvisers Orchestra (OIO) of the United Kingdom and premiered by Smith with the OIO in Oxford, England, in November 2011. 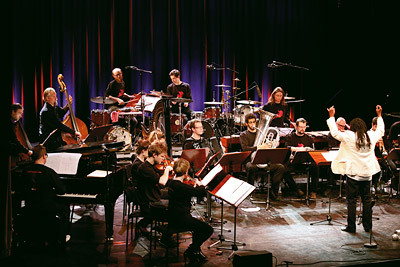 An expanded version was performed by Wadada Leo Smith´s Silver Orchestra at Roulette Theatre in Brooklyn, New York, as part of the two-day celebration of Smith´s 70th birthday in December 2011. For the performance at TUMfest12 and this recording, Smith expanded the score further with new sections. In addition to the more traditionally notated sections that can be performed with varying numbers of repetitions or in different sequences from performance to performance, the composition incorporates the "Black Hole," on this recording explored two times, where the musicians collectively enter unchartered territory and are asked to find their way forward around the rim of the black hole. Wadada Leo Smith: "Occupy The World For Life, Liberty And Justice" is a composition that has been in development for a long time. A fragment and some orchestral ideas for it were already in my notebook, but with nowhere to go, when I received a commission by the OIO. However, when I worked on the score, it did not, from the way it was constructed, provide a clear view on how to select the elements to play in a performance. Therefore, it was hard for me to know what exactly I had. But, with the opportunity to rehearse for a week with the OIO to put this music together, I felt that I could put all the compositional elements in place to resolve the mystery as to how to construct the music in a performance. Inasmuch as the Occupy Wall Street movement in New York City was at its height when I was preparing for the Oxford concert and there was a promise of a broader, more global movement, I decided to dedicate this composition to that movement or, perhaps more accurately, to something even greater that might, over time, develop from it. After the Oxford premiere in November 2011, I rescored the composition for my 70th birthday concerts in December 2011 at Roulette. 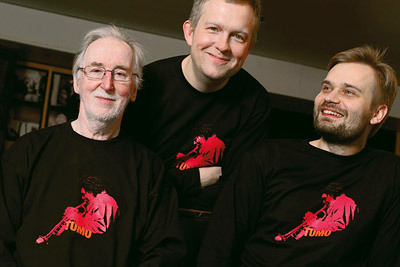 And for TUMfest12 and the recording in February 2012 in Helsinki, I again rescored new parts and, during the rehearsals, added even more new material to the score. The composition has eight vertical-sonic stacks, two sets of melodic-units and a completely independent page of melodic lines to be used whenever I wanted to. It also has two insert scores from other works of mine (from "Kosmic Music" and from the String Quartet "In The Diaspora: Earthquakes and Sunrise Missions"). "Occupy" is shaped in the present moment while it is being performed, and, therefore, the performers and the conductor will experience the construction of the music only in performance.